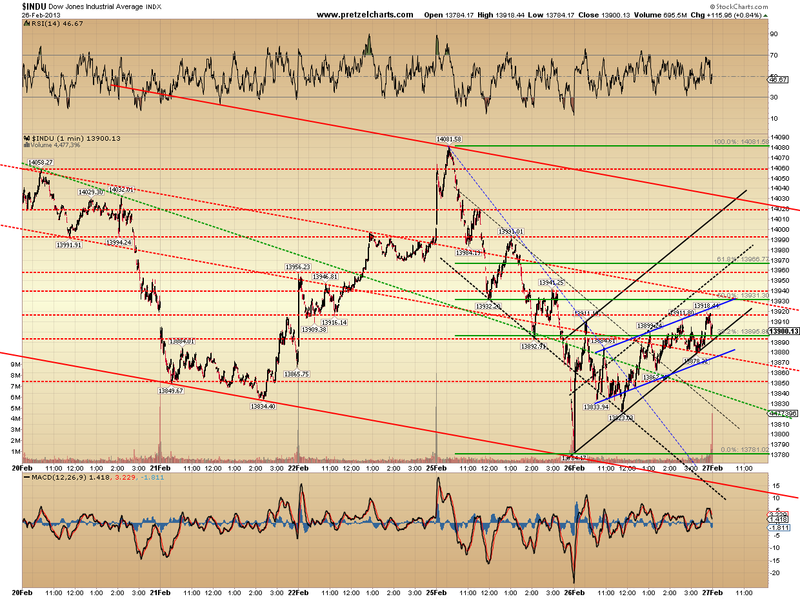 Pretzel Logic's Market Charts and Analysis: SPX Update: Will the Market Break this Pattern? 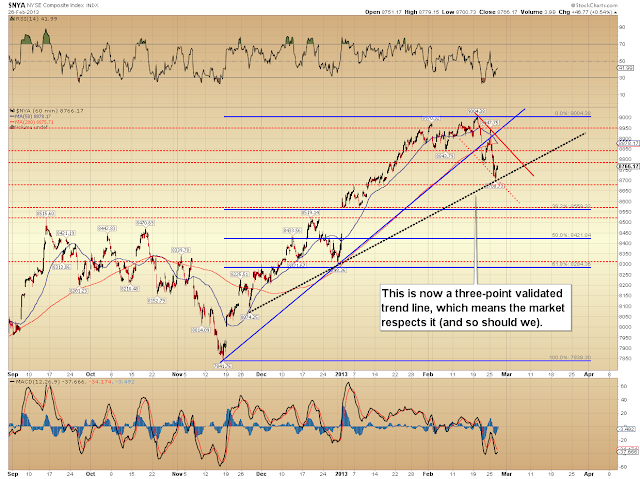 SPX Update: Will the Market Break this Pattern? Some nights I study so many charts that I have no idea how I get the update finished -- and this is one of those nights (I know for most people, the sun is up already -- but for me, since I live in Hawai'i, the market opens at 4:30 a.m.). I've been studying chart after chart, because there's something bothering me about this market, but I can't quite put my finger on it. Sometimes when I look at enough charts, I can figure out what my gut is trying to tell me -- and sometimes it's nothing. Maybe my feeling of nagging discomfort is just normal bull market "wall of worry" stuff. I ran out of time tonight, and couldn't quite pin it down, but may have come close with a ratio I watch. Since this is a currency-driven rally in the form of the QE printing press, I often try to view things through a dollar-lens, so to speak. 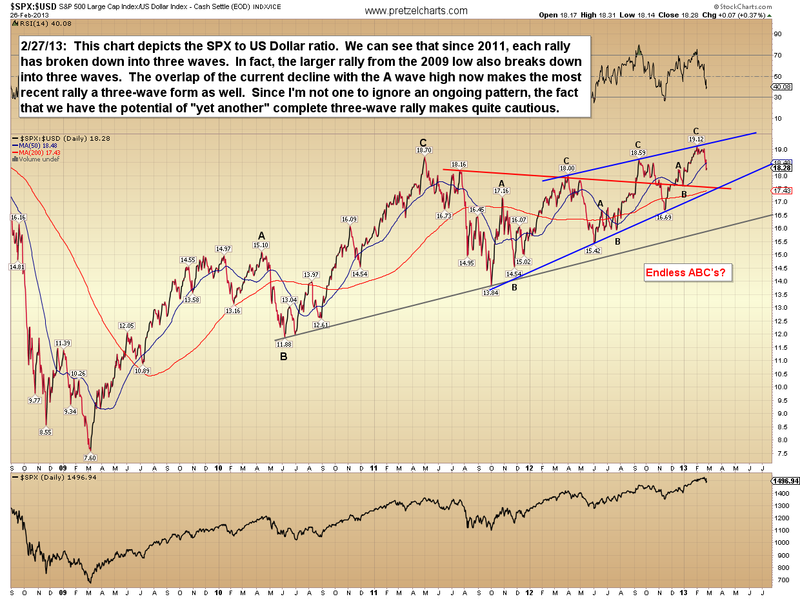 The chart below is a ratio of the S&P 500 (SPX) to US Dollar. This is a bit inconclusive at present, but the chart explains the reason for caution: what's bothering me right now is that every rally prior to this (in the QE era, anyway) has begun a deep correction right where we'd normally expect a fourth wave decline and a fifth wave rally. Maybe this rally will break that pattern -- but given the precedent, it seems unwise to simply assume it will. 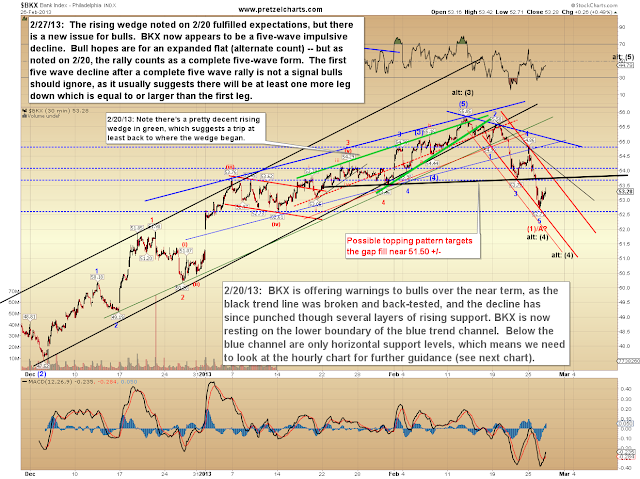 The Philadelphia Bank Index (BKX) is also warning that a larger turn may be in the works. 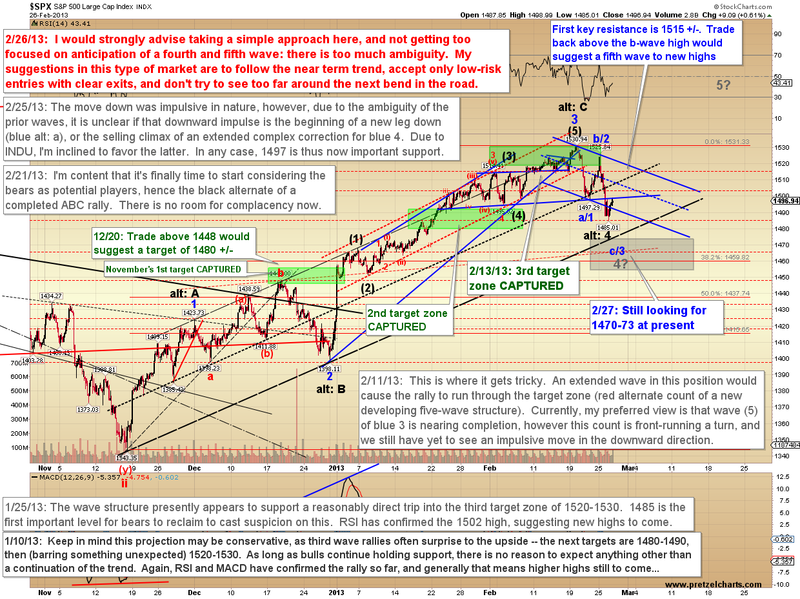 The preferred count for the SPX still has the active downside target of 1470-1473. 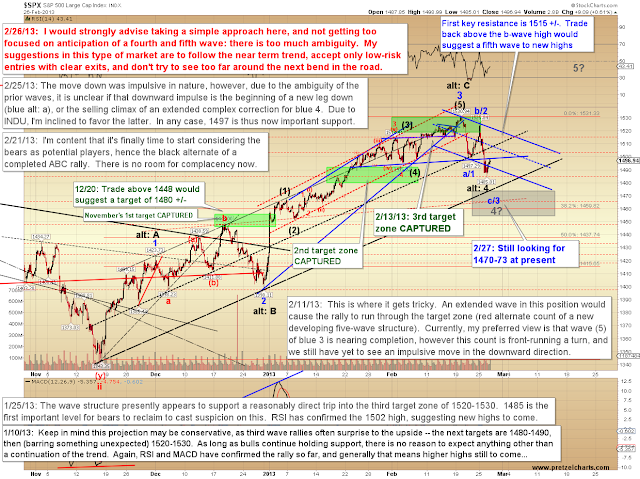 I went over the one-minute SPX chart in detail tonight, and it is possible that the market has completed an ABC fourth wave correction in its entirety (hence the alt: 4), but I presently view that as the underdog. And, as I just noted, I'm having trouble simply assuming we'll even have a fifth wave up. The annotation from yesterday still sums up my approach right now. 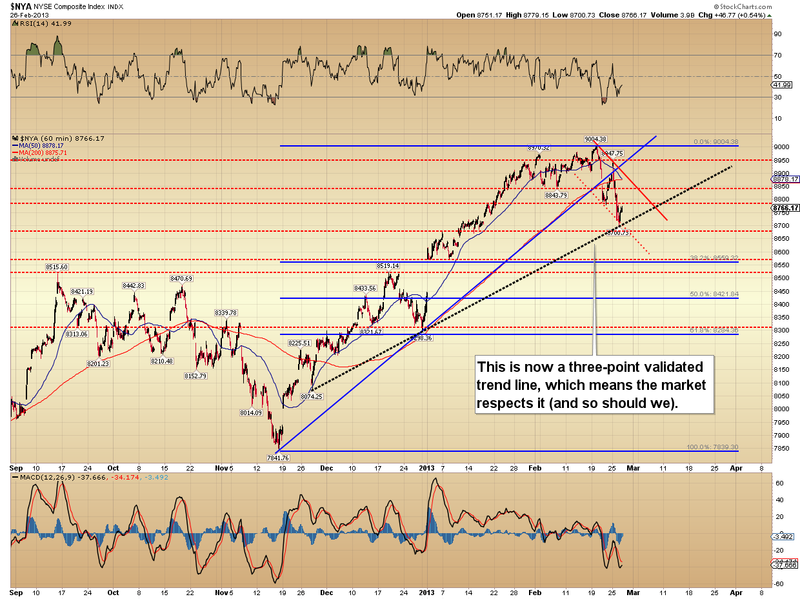 Finally, a short-term chart of the Dow Jones Industrial Average (INDU) which staged a pretty solid snap-back yesterday. 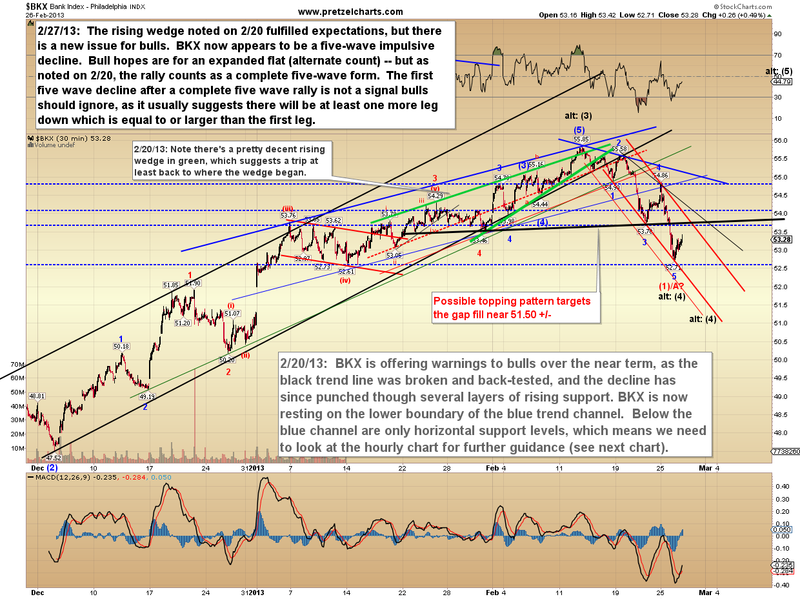 The chart is simply for aid in identifying potential support and resistance areas throughout today's trading session. In conclusion, if it weren't for the market's behavior over the past few years, I would normally be reasonably confident in the idea of a fourth wave decline now underway, and a fifth wave rally still to come. But given the three-wave nature of most rallies since 2009, I am continuing in my cautious stance until I see more signs of an "all clear" from the market. Trade safe. Wonderful site. Plenty of useful information here. I'm sending it to a few friends ans also sharing in delicious. And of course, thanks on your sweat! They're back !! !Looks like the QE zombies are buying again, judging by today's bounce in the SP500. Like the old saying goes "It's hard to keep a good QE zombie down." Glad to hear that. We all need a bit of jocularity once in awhile. I agree that the $USD is the key and what I see in the $USD chart is a triangle on the weekly chart and a head and shoulders on the daily. 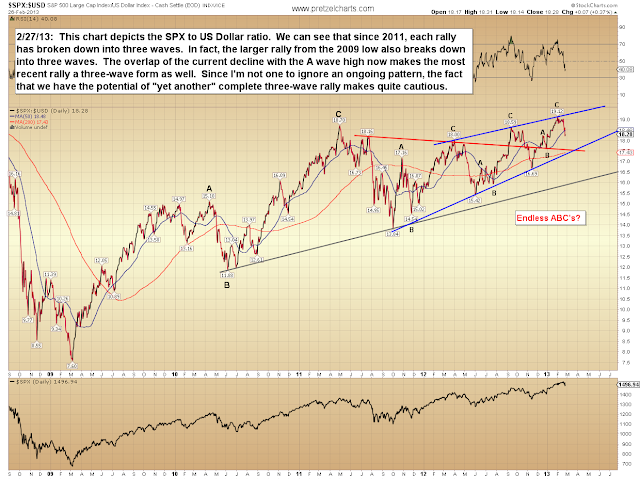 In the following intermarket study, if QE-4-evah starts to have its desired effect and the $USD starts to decline, the market could really see an extended fifth wave up.